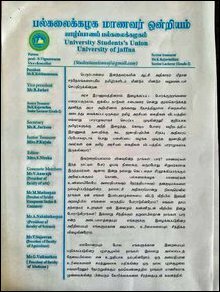 The Jaffna University Student Union has urged the United Nations to demand the SL State to free all the political prisoners, who are languishing in the prisons of the island without any attached conditions. The oppressive Prevention of Terrorism Act (PTA), which is used to suppress the Tamils, should be abolished and the legal system should be conditioned to function impartially. 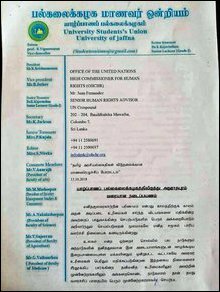 The accountability of the SL State on enforced disappeared, should be addressed at an international level, the JUSU has urged the UN in an appeal handed over to the residential representative of the UN system in Jaffna on Monday. 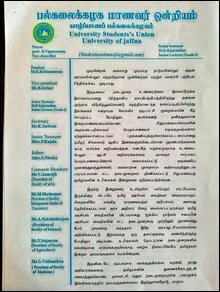 The appeal, written in Tamil and addressed to the Office of the United Nations High Commissioner for Human Rights, said that the SL President Maithiripala Sirisena could have directly evoked his power to pardon all the political prisoners through a collective decision. Mr Sirisena was able to give the full pardon to former SL Army chief Sarath Fonseka, who was convicted by a court-martial due to his difference of opinion with the former ruler Rajapaksa. 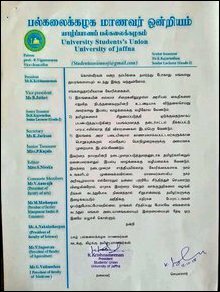 The SL President went to the UN to voice his support to the military that committed war crimes in the island, the JUSU appeal noted further.